Survival is more important than questions about magical fountains. Picard is going to mediate a dispute between some aggressive miners. First he tells Wesley that a place has opened up at the Academy and Wesley will be admitted in 2 weeks. A planet in another system sends a distress signal, an unknown ship has appeared in their orbit and is leaking huge amounts of radiation. As ever there's not another ship nearby, so Picard orders Riker to go help the planet. A small mining shuttle collects Picard and Wesley before the Enterprise leaves. The shuttle has various malfunctions and has to crash land on a moon. The shuttle crashes into a desert and when it turns out that the shuttle captain, Dirgo, has no rations Picard insists they trek to the distant mountains. Meanwhile theEnterprise discovers that the radiation ship is an unmanned junker and will need to be taken through an asteroid field and sent into the nearby sun. The radiation levels are dangerously high on the planet and put the Enterprise crew in danger too. The miners contact the Enterprise to say that Picard and Wesley never arrived. Riker says they can't go and help search until they've dealt with the radiation. Crusher organises her medical team to help on the planet. Geordi is wary about towing the radiation ship and suggests using drones to steer it remotely. It's a good idea, but one drone detaches and trying to move the ship causes more damage and more radiation. They will have to tow it even though it's dangerous. As Picard, Wesley and Dirgo hike to the mountains Wesley's modified tricorder picks up an odd energy reading coming from the mountains. He doesn't know what it is, but they don't have any choice about their destination. 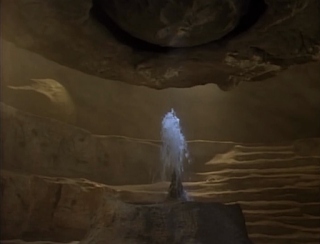 They find a cave with a fountain that's protected by a forcefield. Dirgo tries blasting it with his phaser, which makes an aggressive, swooshing light appear and shake the cave. Dirgo ignores this, and Picard's orders for him to stop, until the light swooshing light knocks his phaser out of his hand. 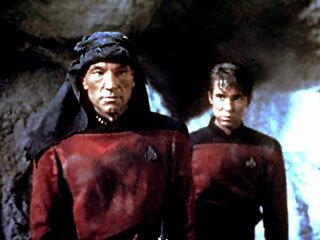 Picard pushes Wesley away from falling rocks and is hit by them himself. Later Wesley is checking Picard's wounds, and Dirgo reckons the Captain is a goner. 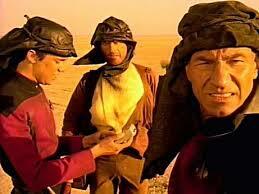 Picard quietly tells Wesley that he will have to keep Dirgo in line while he figures out how to get the water. Wesley doesn't want to face the fact that Picard might die. 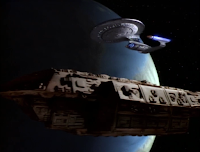 Dirgo uses Wesley's fears for Picard to make the Ensign help him shoot at the forcefield again. This results in Dirgo being attacked by the swooshing light and encased in a hard, transparent substance. Wesley tells Picard that Dirgo is dead and as the Captain moves in and out of consciousness Wesley tells him that since coming on the Enterprise he's lived his life entirely to make Picard proud of him. The Enterprise tows the radiation ship through the asteroids towards the sun. Radiation levels get higher on board and approach critical levels. Power is diverted to the shields and the tractor beam, but any attempt to speed up destablises the beam. Crusher has most of the crew moved to the middle of the ship. The miners say they've started looking for the missing shuttle, but they don't have a lot of ships that can search, they ask the Enterprise to come soon. Eventually they clear the asteroid belt, with just seconds left before the radiation would have become lethal. Once the toxic load is headed for the sun they go to search for their missing crew. Picard tells Wesley to seek out the Academy groundskeeper, a very wise (and presumably long-lived) individual who helped Picard when he was there. The Captain tells Wesley that he's always been proud of him. Wesley desperately promises to save Picard. He examines the fountain and the energy coming of it, then activates the forcefield with his phaser. The swooshing light appears and Wesley halts it by frantically pressing keys on his tricorder. It fluctuates a bit and then swooshes through Wesley without visibly harming him. When he turns around the forcefield disappears and he's able to collect water for Picard. Later Wesley is woken by his relieved mother as the search team finds them. Picard does his whole stern headteacher act when giving Wesley the news about the Academy, it's actually kind of nice. The Captain has assured the Academy that Wesley is capable of catching up on what he's missed. It sounds like the Academy backfill places rather than having a second intake - what happened to the person whose place Wesley is filling? Picard is respectful of shuttle captain Dirgo, and gets respect in return. He may share Wesley and Geordi's snobbery about the small, rough vessel, but he isn't rude enough to show it. Later Picard gets firm with Dirgo because it's a survival situation and that's the priority. He's a little appalled that Dirgo doesn't have emergency rations and later that he's been sneaking alcohol, which is awful for drinking in this situation, but useful for other stuff. After he's injured Picard accepts that he may not survive and focuses on giving advice to Wesley. He's in and out of consciousness for a while, but hears Wesley's confession and gives him the validation he's been craving. Dr Crusher asks the planet about radiation levels and sickness, then briefs her team about making and distributing anti-radiation medicine to areas on planet affected. She asks them to coordinate with medical teams on the planet, this kind of cooperation shows respect. When Troi tells her that Wes and Picard are still missing Beverly is very worried, but focuses on her lifesaving work. When the Enterprise has to tow the radiation ship anti-radiation medicine is pumped through the vents (I assume that's Crusher's idea, or at least came from her team, though that isn't specified). As the radiation levels increase towards the point where the medicine can't help, she orders that non-essential crew and family members be contained within internal corridors to limit their exposure. Geordi was bemused by Dirgo's efficiency modifications to his ship, but he tells Picard it'll be safe. Clearly he was very wrong (and again the other Engineers all seem to be... um, wherever it is that they go). He's clearly bemused by the mining shuttle with it's non-standard modifications, and though his comments to Dirgo are fairly neutral he's clearly giggling about it with Wesley. I actually understood Geordi's solution to moving the radiation barge. This almost never happens (admittedly I've largely stopped trying). Towing is very dangerous, so send a drone to do it remotely. Makes sense. Turns out it doesn't work (the first solution never does), but I understood what was happening. The towing scene doesn't seem very dramatic because the radiation is invisible and though the ship is being pushed to its limits everyone is being calm and professional about everything. He's late to see Picard at the start because he was doing a volatile experiment, do all the kids and/or Ensigns on the ship get to do whatever volatile experiments they like? Wesley has also been studying how outpost legal decisions affect Federation law, so Picard thinks the mining dispute will be useful. Though it turns out it's kind of an excuse for a trip. Wesley is snobby to Dirgo about his shuttle, which is unnecessarily rude. Wesley then gets defensive about Picard and his orders whenever Dirgo is doubtful, which I think embarrasses Picard a little. Wesley doesn't want to accept that Picard could die. As a doctor's son he's firm with Dirgo about applying pressure to Picard's wounds, but can't keep Dirgo in line elsewhere. It's not surprising as Dirgo is a stubborn adult who's not used to taking orders. 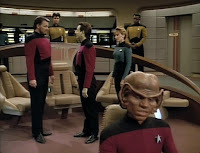 Wesley wants to investigate further but as Dirgo wants action so he rides roughshod over Wesley's objections and uses the lad's concern for Picard against him. Wesley tells Picard that all the stuff he's been doing since he's been on the Enterprise is to make the Captain proud of him. On the one hand it's kind of sweet that Wesley has been so inspired by his role model. On the other it seems a bit odd that Wesley has done so much (excelling at school, extra study, experiments, working on the ship, becoming a crew member, applying to the Academy) just to make one man proud of him. 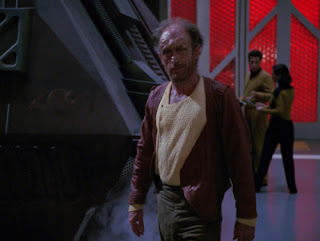 Picard has never placed any such requirements on Wesley; though he and the other crew had always encouraged Wes, it seemed to stem from his own ambition. Did Wesley actually want to do any of that stuff for himself? If not then this nice moment takes on a weird edge, but given who smart/exceptional/precocious Wesley is I can see he would've been a problem if he hadn't been kept occupied. I can understand that Wesley views Picard as a father figure, the Captain is friends with both of Wesley's parents and is the one who brought Pa Crusher's body home after he died. I feel like Wesley may have gone a bit overboard in a way that might not have happened had his father still been around. Picard doesn't seem to have much to do with Wesley's upbringing (which is absolutely fair enough, they aren't related). I hope that Beverly had a word with Wesley at some point about taking on too much, or doing things for himself sometimes. As Captain, and sole operator, of a mining shuttle Dirgo seems to fulfil various US working class stereotypes. At least I think that's what happening, my main sources are admittedly US TV and film, but I see similarities here with other depictions of/stereotypes about working class people. The Enterprise and most of its crew have always struck me as being very middle class. Wesley is initially amused by Dirgo and his crappy little ship, which just comes across as snobby. Dirgo himself is proud of his ship and the work he does, and defensive about his limited resources, which is fair enough. This episode shows just a glimpse of the differences between those living on Starships and those who live and work in more dangerous/less privileged situations. Dirgo starts out thinking Picard isn't tough because he's is formal and a Starship Captain, so he won't be able to cope with a load of rough miners. Picard being English/French (I don't think it really matters which in this context) probably adds to that. Dirgo by contrast seems straightforward, a working man doing his job as best he can, ignoring the giggles of those posh Federation folk with all their resources. The episode goes on to show him as stubborn, impatient, crafty (for the sake of booze no less), argumentative and unwilling to accept what he doesn't understand. In an episode (and a show) full of officers and diplomats it's a shame that Dirgo is the main antagonistic character here. I mean a lot of the words I've used to describe him are lazy stereotypes, but that's how Dirgo is. Plus, as we never see or hear from any of the miners (just someone reporting their messages asking the Enterprise for help because they don't have good enough ships), Dirgo is basically representative of all of them. The main other thing we hear about them is that they are prone to violence, the image of the Undeserving Poor just paints itself really. I don't think there's any attempt to examine anything here, just the writers wanted a working class character and this is what they came up with. He's never malicious but the fact that his own stubbornness and ignorance get him killed feels patronising and off. On a desert moon there are mountains, in the mountains is a naturally-formed cave with naturally- formed steps and a naturally-formed entrance tunnel that's conveniently shaped like a doorway. I guess that the naturally-formed fountain is protected by a naturally-formed forcefield and a naturally-formed creepy spirit thing? Hmm, actually I'm pretty sure this is a magic cave with a magic fountain. Why is it guarded by something that looks like it should be living in the Ark of the Covenant and melting the faces off of Nazis. Plus the guardian can somehow encase people and things in an amber-like substance. I realise that survival takes precedence, but no one seems the slightest bit curious about what's going on here. Is it the remains of a forgotten-but-advanced civilisation? Is it a manifestation of a lifeform unlike any encountered before? Is it an alien who's just curious and wants to be friends but doesn't know how? Seriously this is Star Trek, it must be one those! I know Wesley keeps mentioning energy fields and electrically-deposited something-or-other and scans the hell out of everything, but that doesn't answer my questions. I was kind of hoping it would be the Fountain of Youth, or a healing fountain maybe, which I suppose it might have been because Picard was on death's doorstep. It's odd that after carefully testing the forcefield and the swooshy guardian and defeating them with button pushes Wesley doesn't stop to check that is just water. It could have been anything. Everyone and their families has to huddle together in corridors on specific decks. Just standing there waiting to get radiation sickness. Join Star Fleet today! 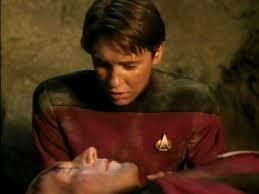 While being carried out of the cave on a stretcher Picard tells Wesley that he will be missed. This is the first book I've read by this author, and I really enjoyed it. 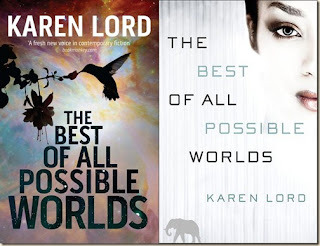 My version has the hummingbird cover, but the elephant one is also cool. The Sadiri home-world was destroyed leaving the galaxy's elite diminished and scattered. Many refugees were taken in by Cygnus Beta, a planet that has always been accepting of exiles and refugees. Councillor Dllenahkh is a leader in this new, mostly male, Sadiri community. Grace Delarua is a Biotechnician and translator working for the government in the area where the Sadiri have settled. They devise a scientific mission that involves travelling around the diverse and varied communities of Cygnus Beta, searching for communities that might wish to follow Sadiri ways, or women who have Sadiri traits and might be willing to become wives and mothers of the next generation. The missions faces various adventures and set backs and even a few disasters. Meanwhile Delarua discovers bad history within her own family and some surprising capabilities within herself. Growing closer to the Sadiri, especially Dllenahkh, she learns to see through their emotional restraint and they learn to accept their new environment while overcoming their reduced circumstamces. Delarua is so great, I love her. The bulk of the book is told from her point of view and I found her narrative voice very easy to get along with. She's confident and competent in her work, she has a fun manner and a good sense of humour. She's mostly cheerful and positive with her friends, clearly loyal and kind of protective to those who mean a lot to her. It's clear she cares greatly about her family, even though that turns out to be a source of pain and conflict within the story. She's not perfect though, like anyone she's capable of focusing on her own flaws and failings. She can overlook or diminish her own accomplishments and achievements. She's happy to help others but wary of asking for/accepting help because she fears being a burden on anyone. She seemed like precisely the sort of person I might want to be friends with, but might equally be a bit intimidated about approaching. Plus a lot of her internal irritation at herself seems familiar to me. Dllenhkh is also good character, we see shorter sections of his viewpoint, which makes sense as he's less open and effusive than Delarua. Despite this the book gradually uncovers a deep well of feeling within him that is compelling. The tour of the planet is interesting because it displays so many varied kinds of societies and cultures. That shouldn't be surprising really (just look at our planet now), but I think I'd gotten used to the SF shorthand 'planet of hats' trope, where each planet/nation/species/race displays a single type or quality. At the end of the book the author explicitly states that she was basing the the varied cultures of the planet on the Caribbean. I knew that I didn't know much about the Caribbean, but that was a moment that made me realise the depths of my ignorance while also piquing my interest. Within the world of the book the reader is given glimpses of things that have a wider unseen context. I think the word 'matriarchy' is only mentioned once, and it's not a big thing in context, just a passing comment. I realised that quite a few of the cultures we're shown seen seemed to be equal or matriarchal, but it's not in your face, or making a point, it's just background. That makes sense, why would someone who'd always lived in a matriarchy find it something worth commenting on? There is much mention of different types of people, and it was never explained because the characters never needed to explain it to each other, that's the way their world is. I got the impression that various groups that are mentioned are all different types of human from different worlds, and can be considered akin to ethnic/racial groups or heredities, but with different types of abilities. Of course I could be very wrong as I was just picking up on hints.. There's a lot of world around the edges of the story we see here, which is great. The focus isn't on those edges but there's just enough details or mystery to intrigue. The occasional references to Terra (Earth, I assume) were enigmatic, and I felt sure that I was getting only a glimpse of something. In fact I could see potential for lots of different stories on different scales to what we get here, and it's both clever and tantalising. The central story itself was really rewarding. In some respect it's a bit strange to have a scientific mission focusing on what is essentially a search for genetically suitable wives. There could easily be something off with this concept, but Lord avoids any creepy eugenics tone. It is clear that the Sadiri have little choice but to find new (and creative) solutions for their civilisation, and this is just one option. There's no denigration of those who are different to the Sadiri, nothing imperial or controlling about the project. If anything looks like it could go that way Delarua and her Cygnian colleagues would shut it down fast. With so many cultures that have varied social structures, including polyamory and selective breeding, a different approach is not something that is hard for everyone to understand. The set up initially seemed like the kind of scientific mission that gets interrupted by something else which turns out to be the true focus of the plot (like in a certain TV show I have written many reviews of on this very blog). Except that here the scientific mission is the focus of the plot. Though things often don't go smoothly, and at times are actually disastrous, that is all part of the mission itself. It's a series of adventures -like you might get in sci-fi TV- some linked to place, some to circumstance/events and some to character background. Some are resolved in a fairly short time, others have deep and underlying consequences that ripple through the story and beyond. Throughout all this the core of the story is seeing this group of characters who have been thrown together in a professional capacity grow into a strong group with friendships and romantic tensions. I would like to talk about the romantic tensions for a moment, because it turns out that this book has exactly the kind of thing I like and didn't realise I needed in my life. This isn't a romance story and it certainly isn't erotica (not that there is anything wrong with either of those genres). It's a science fiction story which has a strong character-focus and it turns out that certain of those characters are in love. I liked that there was an established married couple on the mission, because it's nice to see stable, long-term relationships represented. Then there is a blooming romance which grows, without the characters quite realising at first, between someone who has various issues in that area and someone whose culture is emotionally restrained. I loved that so much! Also I've had issues and can be a bit restrained, so it was great to see that neither character was shamed for who or what they were. I loved that both had good intentions and no one was trying to 'win' or get control. That it was just two people whose circumstances took a while to line up was brilliant. I love slow-burn romances! When done well I find them so much more satisfying and effective than characters falling in love (or into bed) in a sudden, emotional whirlwind. Now this is just my own preference, and one I'm only gradually coming to realise (my own slow-burn romance with slow-burn romances, perhaps?) Also I really prefer romances where people are nice to each other and support and show respect, not that everything has to be all sweetness and light all the time, but it really helps if no one involved is behaving like a jerk. I consider myself more of a fantasy reader than a science fiction one, but I realise that I may well have a slightly blinkered view of science fiction as a genre of writing. If this is the kind of thing that's out there then I would like more please (not that my to-read pile isn't big enough as it is - I went to a convention last month). So if anyone has any recommendations of stories like this, or ones that contain the type of romances I was just talking about, I would be glad to hear them. A direct sequel to a series 1 episode you might have seen and one that feels kind of formulaic. It's Riker's birthday and he has a trombone and candles, but no cake which is surely the best part. Data and Picard are about to join the party when one of the Bridge B-team (who we don't normally see) calls Data over. The Enterprise is being probed by a nearby planet and so Picard calls Riker from his own party because an away team is needed and apparently only Riker knows how those work. Riker, Geordi and Worf beam down but there's interference that makes beaming back hard. As the toxic gas on the planet makes the away team lose consciousness the Enterprise tries to beam them back but its more difficult than it should be. Riker awakes in sickbay where Crusher asks if he remembers her and calls him Captain. He's been in a coma for ten days, but has lost his memories of the last 16 years. She explains that he caught a virus on the planet that remained dormant for years but has merged with his DNA and removed all of his memories since the point of infection. He is now Captain of the Enterprise, Data is his First Officer, there are Klingons besides Worf onboard (though we don't see them) and a Ferengi Ensign. 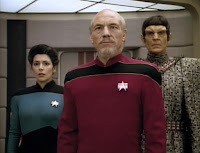 Picard is an Admiral now and he and Troi are escorting a Romulan Abassador to sign a peace treaty that Riker helped negotiate. He also has a son he can't remember at all and his forgotten wife died 2 years earlier. Riker isn't certain about going ahead with all this stuff he can't remember, especially when he discovers the Romulan Ambassador is the Enterprise's former foe Tomalak. Admiral Picard insists that they will support Riker through this. When Riker voices his suspicions he is called to sickbay because his son has been mildly injured. Riker tries to bond with his son, Jean-Luc (yeah, I know), aware of how odd the situation is. He curiously looks at pictures of his wife, and recognises her as Minuet. That's when he gets angry, goes to the Bridge and yells at everyone. He knows none of it is real. The holodeck projection disappears leaving Riker with Tomalak, who reveals that he's in a secret Romulan base. 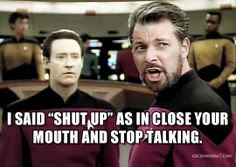 The Romulans scanned his memory for info, and when they couldn't find tactical secrets they used his memories to create a fake-future situation where "Captain" Riker would tell them what they wanted to know. Riker figured it out because the Computer was slow and his "wife" Minuet was never real, just a holodeck projection he created in series 1. The whole set-up doesn't make sense to Riker (or me), but ignoring his questions the Romulans throw him in a cell with the boy whose image was used for his son. The scared child tells Riker he found a hiding place on a previous escape attempt. They knock out the Romulans that come to take Riker away and the kid shows him a large vent to hide behind. It leads to a series of tunnels and caves that are underneath the Romulan base. It looks surprisingly comfortable, but Riker is determined to signal the Enterprise. The boy warns that Ambassador Tomalak controls the comms and Riker is immediately suspicious. It sounds like the Romulans are coming, but Riker realises he's in another fake environment. 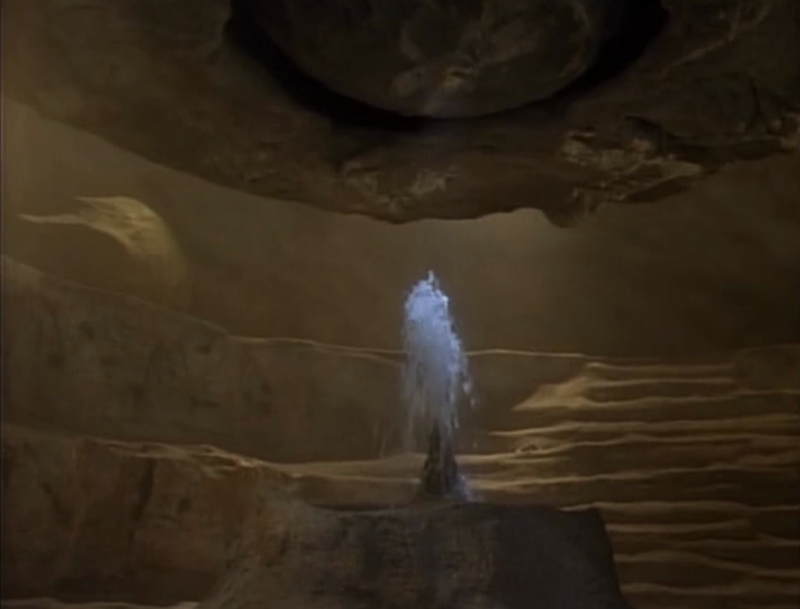 It turns out he and the boy are alone in a cave which has neural scanners embedded in the rocks, which are probably powered by magic or something. Unless it's the kid who is magic, I'm not sure. Riker contacts the Enterprise, confirms that he is fine and so are Geordi and Worf who were beamed back successfully. The boy says he was left there by his mother, to keep him safe. Their people were attacked by enemies and so the mother created this sanctuary for her child to hide in, but she knew she was being pursued so she drew them away. The boy just wanted company so he kept Riker on the planet and used the neural scanners to create a world Riker would want to stay in. The boy reveals his alien face and Riker offers to take him back to the Enterprise so he won't be alone. Don't trust him, look at his beard! 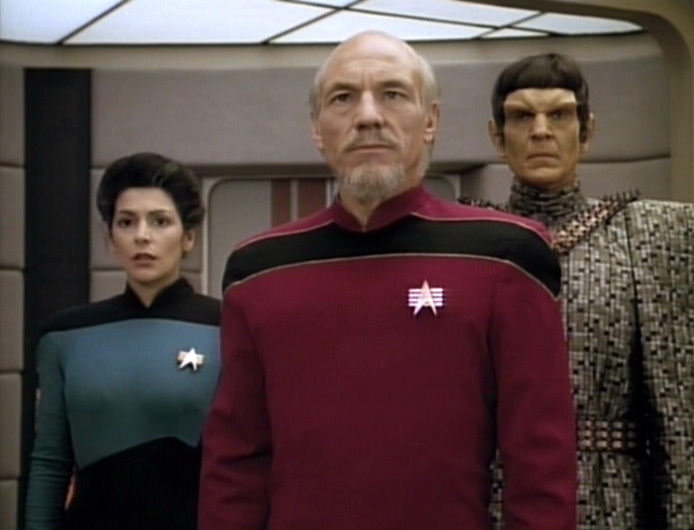 Picard's facial hair should have been a clue that something was up. Only Riker and Sisko (to my knowledge thus far) are allowed to grow facial hair and not be the evil versions of themselves. This is one of the more accurate aged-up versions of Patrick Stewart I've seen, the hair is the main difference. The trombone is back and it's like a whole thing. Just in case you had forgotten that Riker played the trombone that one time in a series 1 episode and that apparently equals a hobby. In fact if you haven't seen 11001001 then this episode will probably seem even more random as it's basically a sequel. Riker gets what he's always wanted, a promotion without having to leave the Enterprise (and without Picard dying). It's telling that when Beverly wants to take him somewhere familiar to jog his memory he insists on going to the Bridge instead of his quarters because "My life was on the main Bridge. Always has been". That's kind of sad really, especially as I think Riker's supposed to be the "cool" member of command staff. He's quite the workaholic, no wonder no one else can organise an away team, bet he doesn't give them chance. I think that's why he and Troi didn't work out, though she's always on that Bridge too (despite having an office elsewhere), so perhaps the real question is why it takes so long for them to get back together? Riker doesn't seem to have accounted for the fact that after a 16 year memory gap he doesn't have the slightest clue what's going on. At least he's embarrassed when everyone stares at him for doing nonsensical stuff. What sport was this kid even playing? 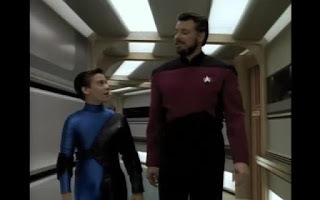 The whole thing with the dead wife and the unexpected son is perhaps less part of Riker's ideal future, but of course the little alien boy wanted a daddy so badly, or something. Riker realises how weird and potentially damaging this situation is for his kid and tries to create a bond, which is of course what the kid wants. Though it seems a little odd to tell his kid that the last he can remember he was in a place where he wasn't sure if he even wanted a kid. The legacy of Pa Riker the jerk still lingers. No reason is ever given for why the little alien boy chose Riker, unless it was just that Riker was the one left behind (not sure how much control the kid had over who could beam away, I kind of thought he was controlling everything). Come to that no reason is given why the kid pretends to be Riker's son, could just have easily been a daughter seeing as how it was all shape-shifting. As with Crusher the future Troi has a little grey in her hair and wears it up now. That's what happens when women get older in Star Trek, I guess? I'm not surprised "Admiral" Picard asked for Troi to come with him when he changed role, she'd been his unofficial secretary for years. Troi is the one who tells Riker about his wife "Min" (that was a clue! ), who was also the ship's counsellor. I'm guess the alien kid realised Riker has a type. I don't understand why Riker refers to his wife as Mrs Riker, William T. Um, I know he doesn't know what it is yet, but she will have her own damn first name! He immediately assumes they were married, presumably because they had a kid, which doesn't have to be the case at all (unless you're a Captain maybe?). Then he uses a form of address that's kinda old-fashioned nowadays (admittedly my family tend to use Mr & Mrs D when addressing letters to me and my husband -lord knows why- but I have only once in my life heard someone in real life vocally call a woman by her husband's full name, and that was an old, posh lady). At first I hoped the computer was failing to find her details because his wife wasn't actually called William. I appreciate it's being done so as not to mess with the reveal, but it seems bizarrely conservative for the future. I honestly don't understand the mores of relationships and family in Star Trek. I get the impression it wants to be progressive and in a previous episode Troi has mentioned the idea of a man marrying a woman because he impregnated her as primitive, but here there's no question that Riker wouldn't be married to the mother of his son. Just like when Lwxana Troi was really horny and that meant she had to find a husband, for no clearly explained reason. It's all confusingly old-fashioned and vague, but I guess it was made in the early 90s, so there's that. That there is a Ferengi Ensign on the Star Fleet flagship in the fake future might seem prescient. At this point I'm guessing Nog (the first Ferengi to join Star Fleet) has never even met a humon. Also Geordi not needing his visor any more is another good prediction. Of course it's all a bit less impressive when you realise that this was an episode full of things the writers later realised they could use. Not that I'm knocking it, that's pretty sensible, but not a cause for amazement. 1. Riker expresses suspicions about Tomalak, Picard and Troi try to reassure him. When he keeps asking questions he is called away by a convenient emergency. Riker (2nd in command), Geordi (Chief Engineer) and Worf (Security Chief) all nearly die from poisonous gases on a planet that probably wasn't a good place for humans and Klingons to go. Turns out the planet not only had toxic gas but also interfered with the transporters. None of these away teams go down with space suits or breathing equipment, ever! They also don't seem to send probes down first to check the atmosphere and pressure. They don't even do a test-transport with a plant or an animal to make sure that there's nothing blocking the systems. Not that we see anyway. They just beam people down and it always seems to be fine, except for this one time when everyone is almost asphyxiated. Bet they won't be wearing space suits next time though. Just as everyone you meet is a biped it seems like every planet you encounter has Earth-like pressure and atmosphere. If away teams were so expendable that you could just chuck 'em down on a planet to see if the air is breathable they wouldn't be staffed by senior crew. Riker beams away from the planet holding hands with the little alien kid. I assume we never hear of him again. 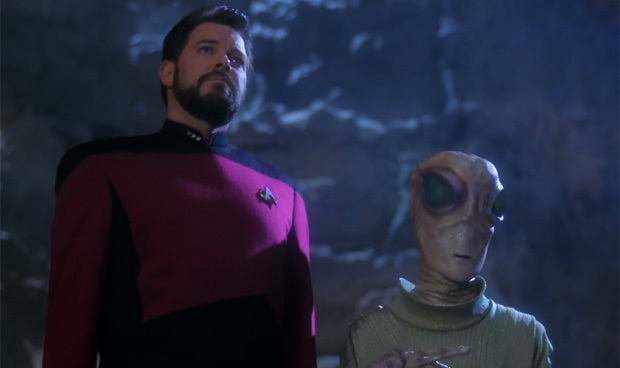 Does the shapeshifting alien kid take Riker's place and use his memories to impersonate him? My guess is no, not at all, but that would have been really interesting.